chop chung wah | Backpacking - Who says, NO money cannot have fun? Normally if you walk into a chicken rice stall, you wouldn’t expect to have your rice served up as balls the size of ping pong balls. 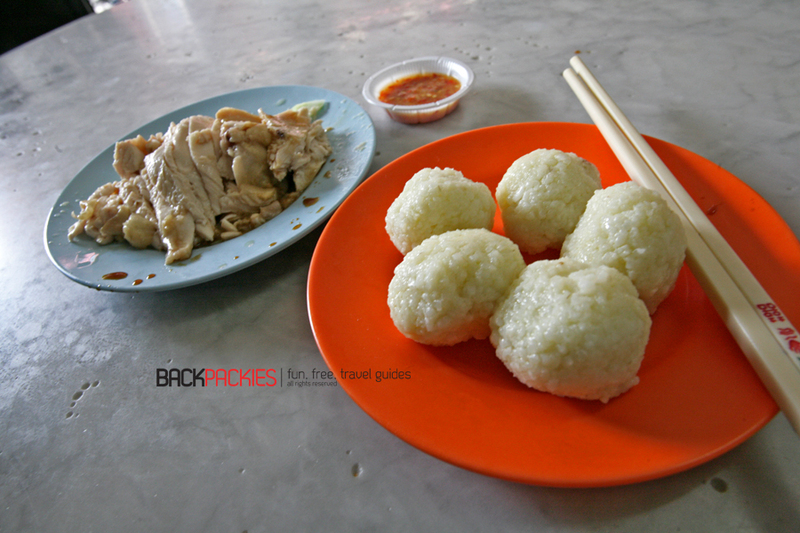 But in Melaka, this is why people are willing to queue up in scorching sun just to have a plate of this “Chicken Rice Balls”. On our recent trip to the historic city of Melaka, we took the 2 hour bus down from KL. Because we were here to do reviews on Melaka, so we needed to try what the locals branded as “famous”. 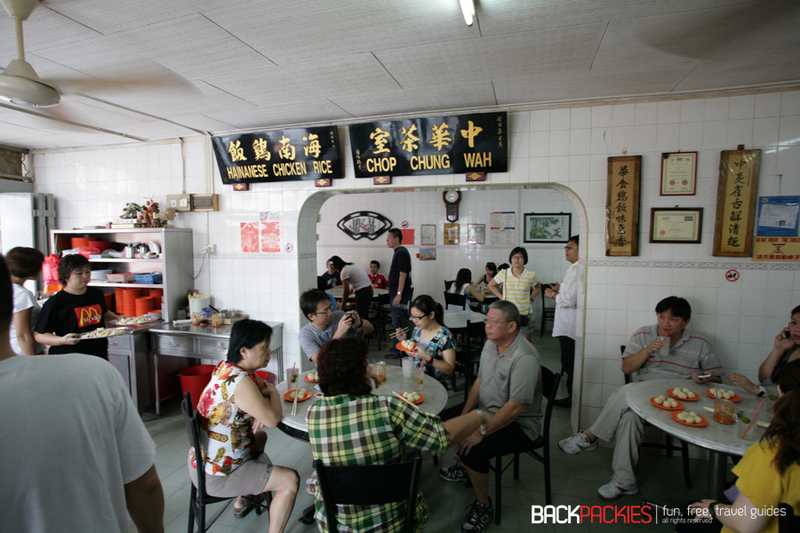 We started off with the Hainan Chicken Rice balls at Chung Wah Coffee Shop for lunch. We arrived about 4pm, which was way after lunch time, so the crowd wasn’t that crazy. Honestly I’m not a very patient person. I personally believe in going for the alternative even though the stall isn’t that famous. Take for example the Sate Celup in town. I couldn’t be bothered with waiting 2 hours just for people to take their own sweet time to dip and chat while we fellas are grumbling standing by the side of the road for them to finish. If you are coming from the Tan Kim Seng Bridge, the yellow signboard on your right is Chung Wah Coffee Shop. If you are walking from Dutch Square where the red buildings like Christ Church or Stadthuys are situated, keep look up on the right hand side of a white colour building. Chung Wah is exactly on the right corner after crossing over Melaka River by Tan Kim Seng Bridge. It is a simple and clean coffee shop. At the top of the coffee shop, you will see a traditional Chinese name plate hanging high above an arch, describing the name of this shop usually implies it could be a family business run over generations. Our order came in like 7 minutes to be exact. (I do time these kind of things). I ordered a glass of home cooked barli which was a thirst quencher after our tiring trip up from KL. The chicken meat was smooth, juicy and tender. My plate came with 5 chicken rice balls, which were about the size of a ping pong. Im not sure about the statement that other bloggers write about the rice “The rice was soft and sticky consistency that binds the rice grains together. It’s strong enough so that you can pick it up easily with chopsticks yet it melts away in your mouth. The taste of the rice balls is a gently fragrant one but it lingers in the mouth and you just keep popping in more of those rice balls! Needless to say this is why I keep coming back for it” To me, when my rice balls came. It was just a simple compacted ball of rice which I had to flatten with my spoon in order to put it into my mouth. Then I started asking myself. Wouldn’t it be easier to just eat normal rice? Instead of ordering something round, and then flattening it again? But this is what I personally think. To the other thousands of people who has eaten and written about this place. They put two thumbs up for this place. I say, come here if there is no one in the queue. My personal theory of “They decided one day to roll up the rice into balls out of boredom” doesn’t seem to be popular with the locals. p/s: I used to think , it was some genius lazy fellow who grew lazy of scooping up spoons of rice into his mouth. Since it was much easier to just gulp it with one go, if it was rounded! So upon digging, I found out that in the olden days, the rice balls were invented because they stayed warm longer and were easier to transport, so farmers and labourers would pack them into wooden containers and take them out to the plantations to eat. 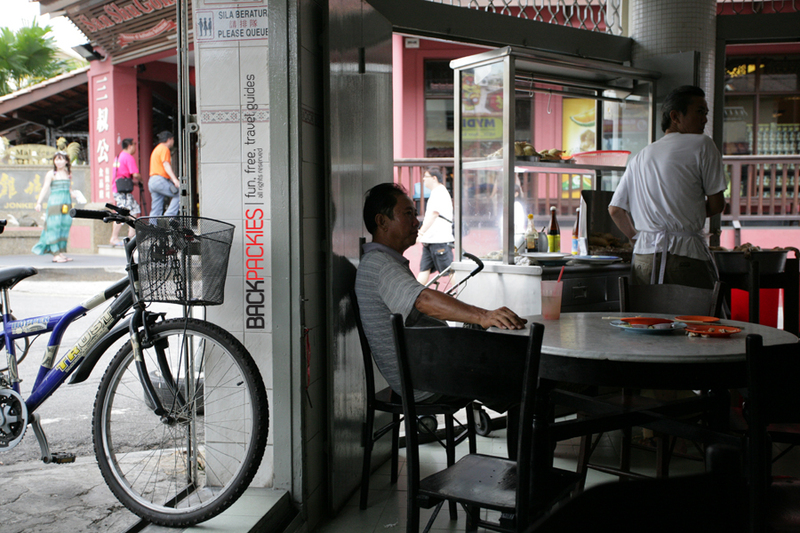 So for iconic sake, besides buying a t-shirt to proof you have been to Melaka, you might as well grab a stool, order a –kopi o and enjoy a plate of Chicken Ball Rice. For more backpacking tips and information, do visit join our travel group on facebook. At backpackies is now on facebook.